SCVHistory.com CH1040 | People | Charles Alexander Mentry. 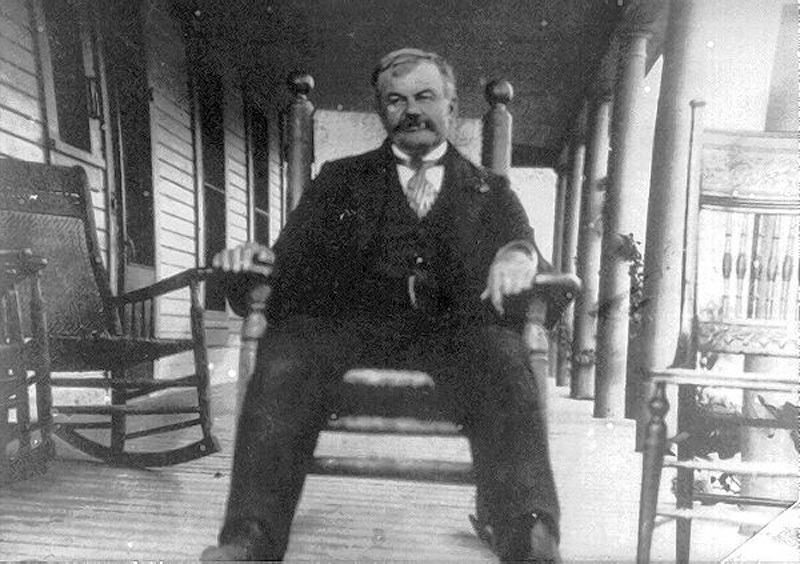 Oil driller Charles Alexander Mentry on the porch of his Pico Cottage (aka Big House). The print bears the hand-written date of 1893. Born Charles Alexander Menetrier (maybe) in France on March 27, 1847 (probably), "Alex" Mentry came to the Newhall area in in 1873 to find his fortune. Already an experienced oil driller who had punched 42 successful wells near Titusville, Penn., Mentry soon landed a job digging wells in Grapevine Canyon, at the southern end of the Santa Clarita Valley. In 1875 he formed a partnership to purchase a claim in nearby Pico Canyon, which had been explored in the late 1860s by Newhall entrepreneurs Sanford Lyon, Henry Clay Wiley and Los Angeles lawman William Jenkins. The claim had produced only moderate results, but it held great potential if only someone with sufficient technical and engineering skills would come along to work on it. That man was Alex Mentry, who punched four new wells (Pico No. 1-4) near the old Lyon-Wiley-Jenkins hole. It wasn't long before a San Francisco fiancier by the name of Demetrius Scofield — himself an old Pennsylvania oil man — caught wind of what was going on outside the sleepy burgh of Newhall. Scofield purchased Mentry's claim in 1876 and convinced the oil driller to come into his employ. Mentry used what may have been California's first steam-powered oil rig to drill a fourth well, which consistenly produced 30 barrels of oil per day. Mentry kept digging. Finally, on September 26, 1876, from a depth of 617 feet, a mighty geyser of oil shot through the 5 5/8-inch casing of his No. 4 well. It was the first commercially successful oil well in the western United States, and Demetrius Scofield was a rich man. Teams of oil workers flocked to Pico Canyon, which was soon being called Mentryville. Alex Mentry married Flora May Lake of New York, who gave him three sons and a daughter. They lived in a 13-room Victorian mansion at the base of the canyon. In 1900, Mentry, already suffering from chronic kidney disease, contracted typhoid fever and was hospitalized in Los Anglees, where he died Oct. 4. He was laid to rest in the Evergreen Cemetery in Boyle Heights, where other family members are also interred. Information from Chevron/Standard Oil records; published works of A.B. Perkins; and "Pico Canyon Chronicles: The Story of California's Pioneer Oil Field" by Jerry Reynolds. Cemetery information from Jack and Joan Beitzel. CH1040: 9600 dpi jpeg from smaller jpeg.